I stare down steel claws and begin to feel sick in the pit of my stomach. But I assure you it is not, it will be the death of me and that I know it. Whoever thought this was a good idea was a fool. Trains running ABOVE cars? What if they derail, what is the spill something or the tracks break? Oh and to make it more fun lets do this over water? 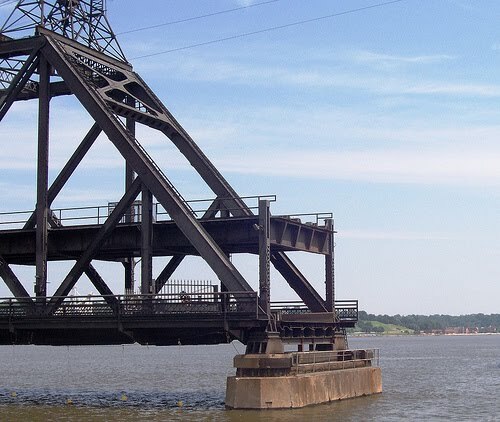 If that's not enough excitement and danger for you we are going to take it one step further and make the bridge open, oh yeah just for shits and giggle lets make it swing open so barges can get through. Oh and there is walkway along it to so you walk across it, next to speeding cars, over the great Mississippi and under speeding trains. This is some engineers sick joke. My friends are oblivious the danger. Laughing, singing to whatever is on the radio as I breathe shallowly and try not to pass out from fear as we enter the underbelly of the death bridge. Then it goes from bad to worse, we suddenly stop. "What's going on, why are we stopping in the middle of the bridge?" I blurt out, a little to anxious, and little to loud, I am almost hyperventilating. "The bridge is just opening K says with a laugh and the toss of he hair. See the barge over there?" Are you kidding me? We have to sit here on the bridge, over the water, under the train tracks while half of this bridge swings open to allow a barge to pass? What would happen to all of us if the barge hit the bridge, or a train started coming and couldn't stop. What would be come of us. I mean we are now just hanging out on a bit of bridge over the water, does this look safe? Or sane? I collapse back into my seat. "Mel, Mel are you okay, you suddenly look a little green"
"Yeah, Yeah, I'm fine. I just don't like bridges"
Rational, probably not, I mean the bridge was built in 1896 and is still standing. But in the same regard, THE BRIDGE WAS BUILT IN 1896, it could collapse at any moment. I managed, for four years I took the ridicule and laughs and held my breath and closed my eyes. I had to, I didn't have a car and all the cool stuff was on the other side. What we will do for friends and fun! This is prompt 5 "Where does that fear come from? Write about something that frightens you that other people might find ridiculous. Write about it in a poem, a story, or whatever." from MamaKat's Writer's Workshop. You can join in the fun here. I'm surprised how many people are afraid to drive over bridges. I feel like the odd man out for NOT being afraid. I see the reasoning, though. It could be a death trap. Instead, though, I fear bugs and clowns. I have that same fear. Sometimes I feel a little irrational about it. But driving over one gives me severe anxiety and when I'm riding with someone else I have to close my eyes. I have that fear too. On a trip to Louisiana we were stopped on a bridge for a barge crossing DURING A TORNADO WARNING and I actually hyperventilated. Ever since then I get a pit in my stomach while crossing a long bridge. The bridge from the west side of Cincinnati into Indiana is the worst, and we cross that one several times a year. UGH. Stopping in from Mama Kat's. I never think about it too much because you are so right! It could collapse at any second. That is very scary indeed! I have all sorts of fears like this. I drive myself crazy. Who's sick idea was that bridge? I'm not afraid of bridges..but that one? Oh HELL no. That's just crazy. If the convertible was the white VW, the bridge was the least of your concerns!